Last month I had the pleasure of attending a veterinary conference in Seattle focused on end-of-life care. It was a whirlwind four days full of lectures on a variety of topics as well as hands-on laboratories and plenty of information sharing and networking. I came home with a vast amount of new ideas and thoughts, and I will share with you a small sample of what I learned. The conference was put on by a group called IAAHPC (International Association of Animal Hospice & Palliative Care). Although this group is relatively new, they have grown quickly and I found myself surrounded by many veterinarians focused on end-of-life care from all around the world! I met veterinarians from Germany, Canada, and Australia to name a few places. This field of veterinary care is both very old and very new. Veterinarians have been providing this idea of hospice and palliative care in one form or another since the profession started. Talking to owners about diseases and prescribing treatments such as pain medication, anti-nausea medication, and nutritional support are all forms of this care. In addition to providing euthanasia, discussing quality of life is one of the most important and common tasks performed by veterinarians regardless of where they practice. What is new is to have veterinarians focus not just on the pet itself but also on the family, taking a more holistic and multi-modal approach to providing care at the end of life. Our goals are to focus not just on the physical well-being of a pet, but also on his or her emotional and social needs as well as the family’s needs. By looking at all of these at the same time we can develop a care plan that is specific to that pet, family, and situation. This allows for a better quality of life for everyone and a less stressful journey towards end of life. During one of the lectures, I was surprised to see that our own Journeys Quality of Life Scale was mentioned! Dr Heath Hoffman, PhD’s presentation on “Veterinarian Experiences in End-of-Life Care: An Exploratory Study” included the results of a survey in which hospice and in-home euthanasia veterinarians were asked a multitude of questions about their work. 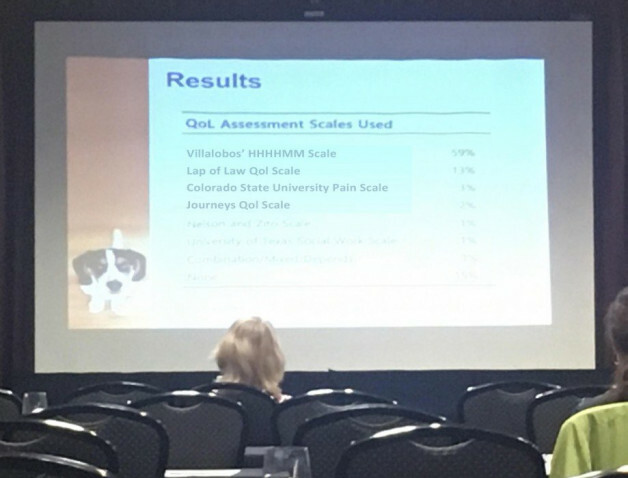 Some of the topics covered included species of companion animals euthanized, locations of euthanasias, attitudes of care, and quality of life assessment tools used. It was on this slide that I found a familiar name even though I was halfway across the country. It was a wonderful reminder of how even a simple scale can have wide-reaching effects for pets and their caregivers. 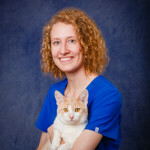 Developing good communication skills, stress-free home appointment techniques, and in-depth discussions on how our sedation and euthanasia medications work, are examples of other topics covered at this conference. We hope in the future to be able to apply this growing body of knowledge to our clients so that they and their pets can feel more comfortable and supported during end-of-life.